Ice cream is one of the most loved dessert in the world. Various flavors offered by ice cream make it more popular. But when it comes to the matter of taste, the tastes of each person, region and even every age is certainly different. Well, this time it will be reviewed about the past ice cream flavors that you have never heard of. Anything? Check the list below. The yellow flour referred to in Japanese is called Kinako. Made from baked soybeans and mashed to give a sensation of peanut flavor to sweet snacks and pastry. Ice cream with kinako flavor itself is often combined with other flavors such as vanilla, banana, brown sugar and other nuts. This taste itself has been around since ancient Japan. Before the vanilla flavor was known, the flavors of flower water were very popular. Amelia Simmons noted in a recipe book in 1796 the first in America that rose water was the mainstay of various sweet snacks. At present, this taste is like it can still be found in processed foods in various countries such as Turkish Baklava, Indian Lassi and Persian ice cream (Bastani sonnati). In the Philippines, sweet potatoes or purple sweet potatoes are commonly used for the basic ingredients of various sweet snacks including ice cream. Moreover, the original color is quite interesting and will beautify the appearance of the ice cream itself. Even though most people think that sweet potato taste on ice cream is a bit strange, but the fans are still included in Indonesia and there are still purple Telo Ice Cream? The taste of sour fruit may be familiar to us as Indonesians. However, it turns out this taste is considered strange for other parts of the world. If you are a fan of herbs, chances are that you will also like the sour taste, just imagine the ice cream is definitely fresh. Asians began introducing sour fruit to Mexico in the 16th and 17th centuries until finally this taste was known in various forms of food such as drinks, candy, ice cream and ice pop. Until now black sesame flavored ice cream is still very popular in Asia, as is vanilla ice cream which is popular in western countries. For a long time, Japanese people will add honey as a sweetener to a nutty base flavor. Actually the taste produced is rather strange, but just as with some other Asian fans that lack fans such as the taste of red beans or the taste of ginger, most people also look at this strange black sesame ice cream. What do you want to try the most flavored ice cream? If all the ice cream flavors above are rare or nonexistent, there must be a reason. One of them is because for people today these feelings will be considered strange. No wonder if there are now a variety of new ice cream innovations such as bali ice cream cake. Moreover, the Bali Ice cream cake not only offers delicious taste but also body health. Because, the latest ice cream is present in low-calorie variants. So, bali cake ice cream is the right choice for those of you who want to maintain a healthy body but also do not want to miss the delicious taste of ice cream. Right now, bali ice cream cake is available in many outlets. 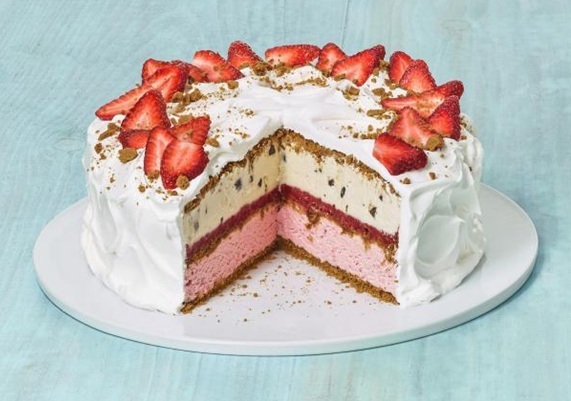 However, Cold Stone Creamery can be the main place you can go if you want to try Balinese ice cream cake with delicious flavors and affordable prices. Cold Stone Creamery itself is an outlet that sells various variants of ice cream, cakes and cakes. Here, you don't need to worry about the price because the cake is so bag-friendly. So, immediately visit Cold Stone Creamery right now if you want to find Balinese ice cream cake.